This post and recipe was written last year for my friends over at Innate Gear, but I figured it was fitting this year as well. Enjoy! Biking into the city recently, it was cloudy and practically dark by 2:30pm. I pulled my wool hat down farther to cover my ears. Despite gloves, the tips of my fingers were freezing. As I went through a large intersection, I looked down one of the main shopping streets. It was covered in lights and spruce branches. I smiled and pedaled on. I know what those lights represent; there’s a reason that streets lined with high-end boutiques are decked out in holiday accoutrements. But I try hard to push those thoughts of consumerism out of my head. Why? Because in the dark of winter, those lights bring a certain emotional comfort. They’re cozy. For me, they’re not necessarily representative of the shopping-bonanza-season. They represent curling up, eating good food and winding down. Because if anything, if you live in a cooler climate, the holidays should be about celebrating warmth. Wool socks, big mugs of tea in front of the fireplace and such. But instead we’re confronted with the world of consumerism, swathed in a “buy this, buy that” mentality. The problem with the world of consumerism is that it provides the illusion of “giving.” We buy a present, wrap it up and check the task off our holiday to-do list. Most people don’t need anything for the holidays. Need is a word that should be associated with needing food and needing shelter. Instead, it signifies our need for a new waterproof jacket because last year’s model isn’t quite what it used to be. We’re too busy to patch it up and keep using it. You know what people need? Love and community. Human connection. We need to spend less time on our computers and more time outdoors. We need to interact and appreciate the bonds that tie us together. Those needs can’t be satisfied by a present in a box. Those needs are satisfied by experiences. We live in a world of consumerism. This means that while certainly once in a while it does make us happy to receive a new thermos or insulated mug so that we can drink spiked cider on the cross-country ski trail, it’s important to focus on the experience that can come with a gift. What comes after the wrapping paper has fallen. Food is a way to do all of these things. Food facilitates our shared experiences, be it a stop for lunch on a leisurely weekend bike tour or the carefully packed backcountry picnic for a day out on the trail. Give food and you certainly give love, which is why, in my opinion, anything food related this time of year is leaps and bounds beyond a new sweater. Those photos of people sitting in a small hut, laughing after their day of skiing, sharing a bottle of wine and a few treats? Those are the memories that last, far beyond the shelf-life of any present you could buy. Plan a weekend outdoor excursion and bring some food; the holidays don’t have to be more complicated than that. 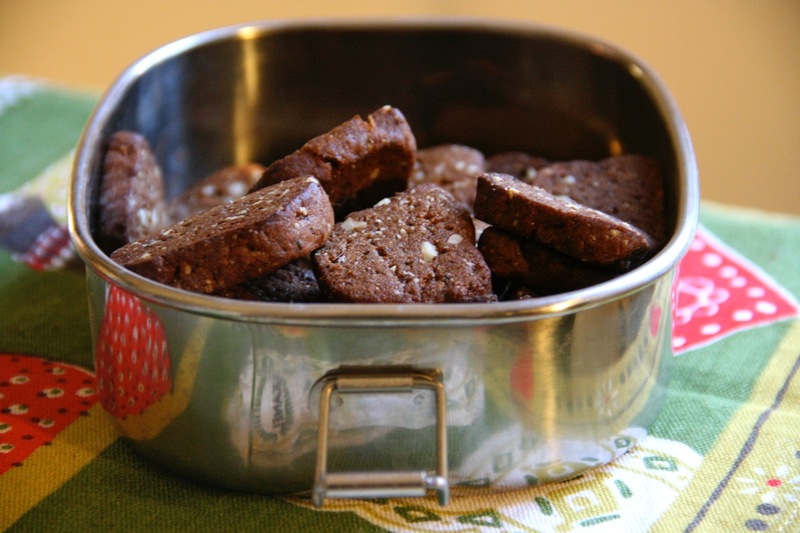 In the spirit of the season, here’s a recipe for gingersnaps that are travel-friendly, fit a variety of dietary restrictions and make your kitchen smell just like it should at this time of year. Baking these gives almost the same feeling as seeing a dark street lit up with lights. The recipe is a rendition on one that my family has baked at every Christmas since I was a child. The original comes from a classic Swedish cookbook called Sju Sorters Kakor, essentially the bible on Swedish baking. 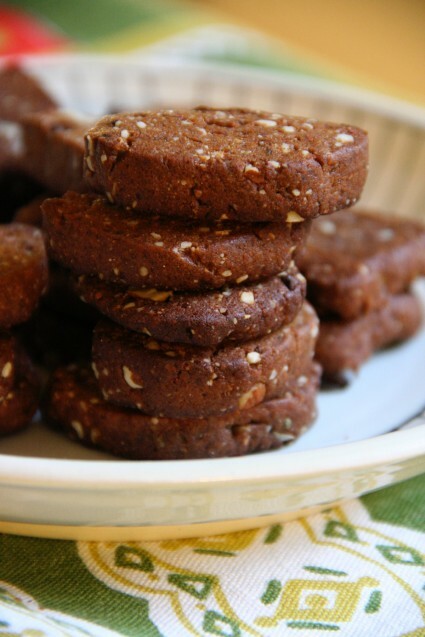 What I have always loved about this recipe is that you get the gingersnap taste – a must if you’re Scandinavian and it’s December – but without the hassle of rolling out dough and cutting it into shapes. In other words, it’s the busy person’s holiday cookie. And as such, you can easily whip up a batch to gift to all of your friends. Or pack into your knapsack for the weekend snowshoeing adventure. Whatever it is, put love into what you give. In a food processor, grind the almonds until almost finely ground. You want to have a fairly smooth, light consistency, similar to almond meal, but you want little pieces of almonds left. Place the ground almonds in a bowl and mix together with the rice flour, baking soda and salt. Set aside while you prep the other ingredients. Place the pitted dates in the food processor along with 2 tablespoons of olive oil and puree until smooth. In a bowl, combine the dates with the rest of the olive oil, molasses and spices until smooth and well blended. Add the wet ingredients to the almond and flour mixture and work the dough together until you can form it into a ball. Roll the dough into two logs about 12 inches long and wrap in wax paper. Refrigerate for at least an hour (you want the logs to be hard so that they are easy to slice). You can also put them in the freezer so that they get really firm. When the dough has hardened, preheat the oven to 375°F (190°C). Cut the dough into slices just a little thinner than 1/4-inch. Be sure to use a sharp knife so you can cut through the almonds. If the edges get a little crumbly, don’t worry! Just form them back together on the baking sheet. Place on a greased baking sheet or silicone baking mat and bake at 375°F (190°C) for 10 to 12 minutes. Because of their dark color, you can’t really gauge when they are done, but if they are noticeably dark brown around the edges, they’ve been in too long.